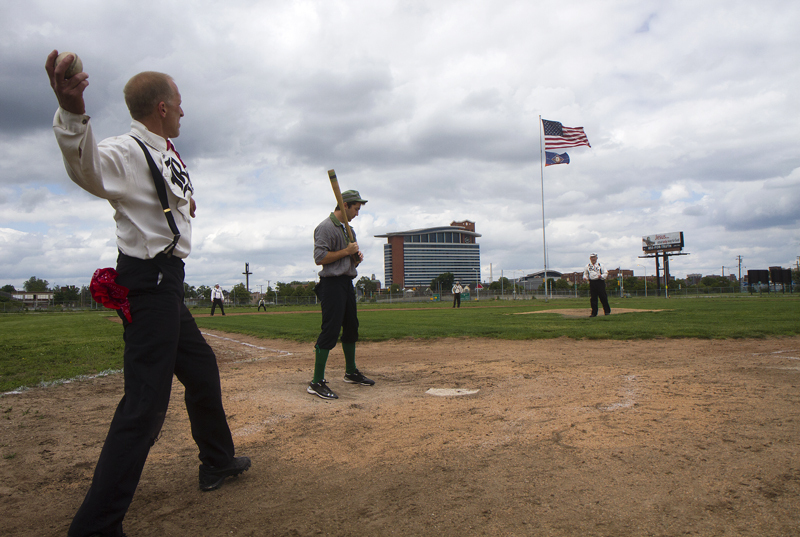 Fans played a game of “1860s baseball” at Navin Field, the site of former Tiger Stadium. Photo by Steve Neavling. 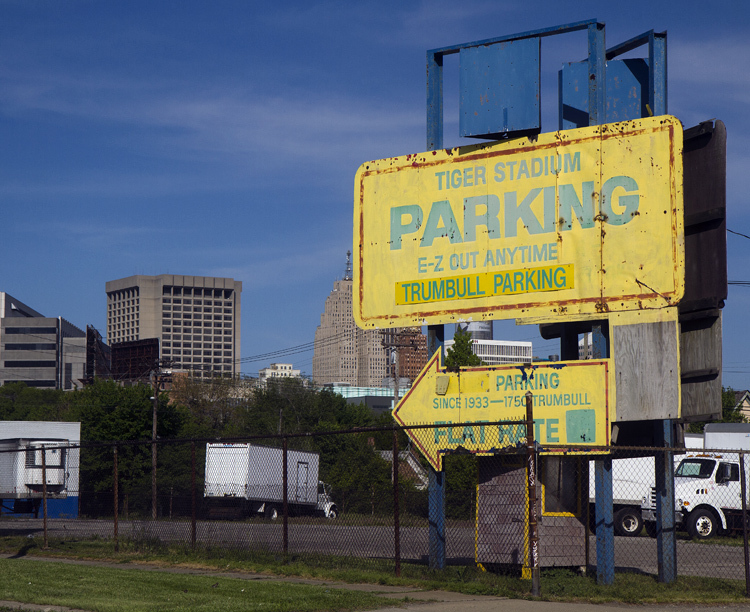 There’s a way the Detroit Police Athletic League can have the program it wants at the site of the old Tiger Stadium without creating so much antagonism with its bullheaded plan to cover up the historic field with artificial turf. The people who saved the historic diamond, those who’ve played on it for the last six summers, and baseball fans worldwide all want PAL to use natural grass for its showcase youth athletic stadium – for which construction is scheduled to begin in early April. PAL adamantly insists it needs artificial turf to stage games from morning till after sunset, even though most experts believe a properly tended grass field can hold up even under that kind of use. The very expert PAL has deceptively mischaracterized as supporting its plan, MSU turf management expert John Rogers, told me about a way out of this dilemma. It’s called Desso Grassmaster. It’s used by the Denver Broncos, soccer teams worldwide, and lots of local communities. The fibers get seeded in real grass turf and help anchor the field. When the rain comes or the field gets pounded and torn up by athletic use, the grass holds together better as the natural shoots hug the more durable synthetic fibers. It’s a “nice product,” says Rogers, who, contrary to what PAL told the public in its initial “talking points,” is no fan of artificial turf. And, he adds, “not one user out of a hundred” would walk or play on the surface and think it wasn’t real grass. It has the look and feel of the real stuff (because it is 97% real) without the toxic side effects of an artificial carpet ­­­– a less forgiving surface, excessive surface heat, and possible carcinogens depending on the type of infill used. University of Michigan students recently held a design competition, and the team that won presented a plan to PAL that takes into account all the social impacts of its proposal. That team reportedly recommended Desso Grassmaster. Considering that such a field would hold up longer than artificial turf if PAL put the effort and money needed into maintaining it, over the long run it would be a better solution for PAL, whose CEO Tim Richey has already said the cost of turf vs. natural grass would be “a wash.” Rogers says it would cost perhaps an extra $400,000 to install than an all-natural field and maintenance would be comparable. PAL announced Feb. 2 that it has met its initial fundraising goal and raised the bar even higher—to $20 million—to support extra stuff. This solution might bring back donors such as the Lear Corporation, which has already withdrawn support from PAL because of its artificial turf fixation, and could attract others. The four foundations who are underwriting the lion’s share of the PAL “Kids at the Corner” campaign would be relieved—especially the Skillman Foundation, which is all about serving kids, but can’t be feeling great about having its name on a plan that endangers the health of young athletes. Eric Larson, who has the green light to build retail along Michigan and housing along Trumbull, would obviously prefer his developments not to border a field that lots of people will hate. He’s been quiet, but I’m assuming he’d like the plan too. Tom Derry and the Navin Field Grounds Crew have no say in the matter, of course, though they’ve kept the field alive through their own sweat equity (and small financial donations) since May 2010. They want natural grass. But a 97% natural grass field is a hell of a lot better than a 100% artificial carpet. The Desso Grassmaster solution would better justify PAL getting a $3 million federal grant to preserve the site. It would prevent Detroit from making yet another terrible mistake at the Corner. In fact, it makes so much sense that a cynic might say Detroit would never do it. Historic preservation and creative re-use at the same time – what a concept! Makes too much sense, right? Michael Betzold is a former Free Press reporter and longtime area freelance journalist. 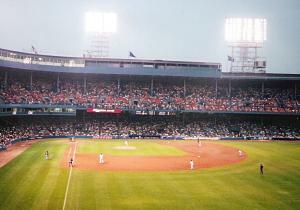 He wrote Queen of Diamonds, a history of Tiger Stadium. He lives on Detroit’s east side. Thanks for keeping the fight alive Michael… I’m the guy that put on the vintage baseball matches that you guys used a picture of every weekend for the last 2.5 seasons. Although I’m pretty sure that won’t return when PAL takes over (I’m considering moving it to Hamtramck Stadium if I can’t find a lot in Corktown to play on) it breaks my heart to see all the work that Tom and the gang did paved in plastic to satisfy Tim Richie’s arrogance. At the lat IBEW meeting I was one of the folks that presented data from the State of New Jersey that talked about not just the health, but both the environmental and even the possible financial impact that artificial turf will cause in the area (a 140 degree heat wall, with accompanying odors, where even birds will not fly over or land on is not going to be what the folks walking around Corktown are going to appreciate in the heat of summer.) I pointed out that if a state like New Jersey, once considered the “armpit of America” thinks that it’s a bad idea that maybe we should to. Ritchie once again in his arrogance just blew it off, like he did everyone else (I still wonder if there’s not some money going in his pocket over this plan) who tried to present a counter argument. The one person who did seem to listen was indeed Eric Larsen, he took the link to the website I was reading from. If the worse case scenario happens with this plastic mess, he, and his mixed use tenants will stand to lose the most. I can see a big empty albatross ringing that field easily, and everyone, including the City Clowncil wishing they had listened to the community. Please keep this alive, you’re one of the few people with the balls to stand up to them. Thank You. Have you been to jersey? Its a beautiful state. Parts are the dumping ground for nyc, but its a much more varied state than just some industry and dumps over the river from Manhattan. They have amongest the highest housing prices outside of cali, its not a universal dump. The worst part of jersey is the accent the people have. Great compromise for a project that 3000 people signed a petition against! Our kids deserve real grass and our history deserves to stand.